Thanks to the pioneering tours of the Creole Band, jazz began to be heard nationwide on the vaudeville stages of America from 1914 to 1918. This seven-piece band toured the country, exporting for the first time the authentic jazz strains that had developed in New Orleans at the start of the 20th century. The band's vaudeville routines were deeply rooted in the minstrel shows and plantation cliches of American show business in the late 19th century, but its instrumental music was central to its performance and distinctive and entrancing to audiences and reviewers. Pioneers of Jazz reveals at long last the link between New Orleans music and the jazz phenomenon that swept America in the 1920s. While they were the first important band from New Orleans to attain national exposure, The Creole Band has not heretofore been recognized for its unique importance. But in his monumental, careful research, jazz scholar Lawrence Gushee firmly establishes the group's central role in jazz history. Gushee traces the troupe's activities and quotes the reaction of critics and audiences to their first encounters with this new musical phenomenon. While audiences often expected (and got) a kind of minstrel show, the group transcended expectations, taking pride in their music and facing down the theatrical establishment with courage. Although they played the West Coast and Canada, most of their touring centered in the heartland. Most towns of any size in Iowa, Illinois, and Indiana heard them, often repeatedly, and virtually all of their appearances were received with wild enthusiasm. After four years of nearly incessant traveling, members of the band founded or joined groups in Chicago's South Side cabaret scene, igniting the craze for hot New Orleans music for which the Windy City was renowned in the early 1920s. The best-known musicians in the group--cornetist Freddie Keppard, clarinetist Jimmy Noone and string bassist Bill Johnson--would play a significant role in jazz, becoming famous for recordings in the 1920s. Gushee effectively brings to life each member of the band and discusses their individual contributions, while analyzing the music with precision, skillful and exacting documentation. Including many never before published photos and interviews, the book also provides an invaluable and colorful look at show business, especially vaudeville, in the 1910s. While some of the first jazz historians were aware of the band's importance, attempts to locate and interview surviving members (three died before 1935) were sporadic and did little or nothing to correct the mostly erroneous accounts of the band's career. The jazz world has long known about Gushee's original work on this previously neglected subject, and the book represents an important event in jazz scholarship. 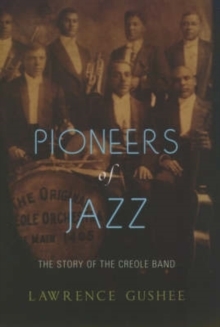 Pioneers of Jazz brilliantly places this group's unique importance into a broad cultural and historical context, and provides the crucial link between jazz's origins in New Orleans and the beginning of its dissemination across the country.